Once you have clicked on ‘Post Comment’ below, your comment will be automatically submitted for moderation by Instantloveland’s editorial team. Assuming it is approved, it will then be published within the comment thread at the bottom of the article. This process will normally be completed within 24 hours. Paul Cézanne died in 1906, and his work became a touchstone of great painting for the century that unfolded, indeed, for our current one too – an oeuvre against which all works can be (often unfavourably) measured. “The father of us all” as Picasso said. I am aware that this is not a view held by all, or possibly even by the many, these days; yet to ‘get’ Cézanne is to appreciate the opportunity that the principles of his work provide us for a liberation in our own art and, as I will explain, how his work also offers a litmus test for the progressive values of a modern society. The name Cézanne immediately conjures up images of choppy interwoven brushstrokes. At first glance, his mature paintings have the appearance of a distinctively systematic approach – every painting just screams “Cézanne”, but to generalise about his painting in this way is a misreading, as throughout his work we find a remarkable breadth of enquiry: the vast array of unique responses to complex vistas, outcrops and forests of the landscape around Aix; the meditative qualities he wrought from his mesmerising still-life works, or those unforgettable portraits; and let’s not forget the legendary sequences of monumental bather compositions he worked on slavishly throughout the latter years of his life. Although he worked with still-life and figures, Cézanne was ultimately a landscape painter. His table-top works became tumbling terrains; faces, furniture and clothing have a topography to them. In all his paintings we can see masses and volumes maintaining their structural integrity whilst being reconciled as worked paint upon the flatness of the canvas surface. Each volume realised by Cézanne has a massive presence akin to that of a geological feature. In all his work three dimensions are successfully and expressively translated into two through a rigorous synthesis. Witness how much tougher Cézanne was with his space than, say, Gauguin, whose exotic, ‘Cloisonniste” patchwork of colours-as-spaces feels far less robust and more generalised by comparison. Hokusai’s prints of Mount Fuji, with their frequent wilful shifts of perspectives employed to fit the formal requirements of compositional elements within a rectangle, offer an intriguing landscape precedent (though the conical volcano was more of a witnessing presence to the unfolding drama of life played out around it). For Cézanne, Mont Saint-Victoire became an ever more dominant centre-stage character as its undulating terrain yielded an inexhaustible amount of relational detail to his gaze. Maybe Rembrandt’s self-portraits would be a better comparison? They too reveal a persistent interrogation of a familiar reality. In the mature landscape work of Cézanne we see tautly constructed spaces, all made with a seemingly generic palette of greens, earths and blues. This is a great lesson from Cézanne: look at the obvious but place ever-greater demands upon it. I often remind myself to “keep it simple, do it well”, Cézanne was not a complicated artist. He learned from Pissarro not only to observe but to ‘step in’ to the observation, to work a painting, and we see him constantly building subtle transitions to make each segment of his painting breathe. This bearing down on every moment, every instance of paint-colour is what marks his art out from others’ – for it is the colour, and how intensely it is committed to in the stroke, that counts. Cézanne teaches us to not take anything for granted. He never drifts into generalisation. How badly we need this quality in public life now. We are wandering about indifferently in an iPod oblivion whilst the most pernicious corporate coup is taking hold of our lives; we see cliché after cliché being trumped out shamelessly by journalists in both fringe and mainstream media, and in the case of the unfolding Brexit miasma, anyone with a degree of expertise is treated as a ‘turn’, or worse, castigated as ‘unpatriotic’ for daring to ask questions of the detail. These attitudes are trickling down into our schools, where intelligence and an eagerness to learn are mocked and bullied as ‘swotty’. New role models are making exploitative money and fame at all costs has become the true measure of success. Why do we celebrate the vulgar and the trivial, and treat integrity with suspicion? Cézanne said: “A healthy need for the truth takes hold of you”. Truths can be difficult to stomach, demanding to be absorbed and acted on; yet ultimately they are what we build our ethical values and societal laws upon. He is a flag bearer for an uncompromisingly intelligent art: and by implication, for a life lived with integrity. Thanks to Cézanne’s labours, pictorial space is opened up to us in ways which compel our eyes to move in constant delight throughout his paintings. During these moments of movement we are continually interrogating the realities, surprises and truths of forthright decision-making. As our eyes move we too are moved at the humanity latent in these subtle yet powerfully-orchestrated coloured forces. An eye scans back and forth across complexity such as this and takes in space both near and far. Movement is subject to time; yet a painting is apprehended at light speed, so ironically, it hits us in one go, as a stillness (Cézanne: “You either see a painting straight away or you never see it.”) A stillness, however, that seems to burn and breathe, rather that one that lies inert. Herein lies Cézanne’s great triumph – the extreme pressure that is exerted, in his best paintings, between these two states: stillness and flux. 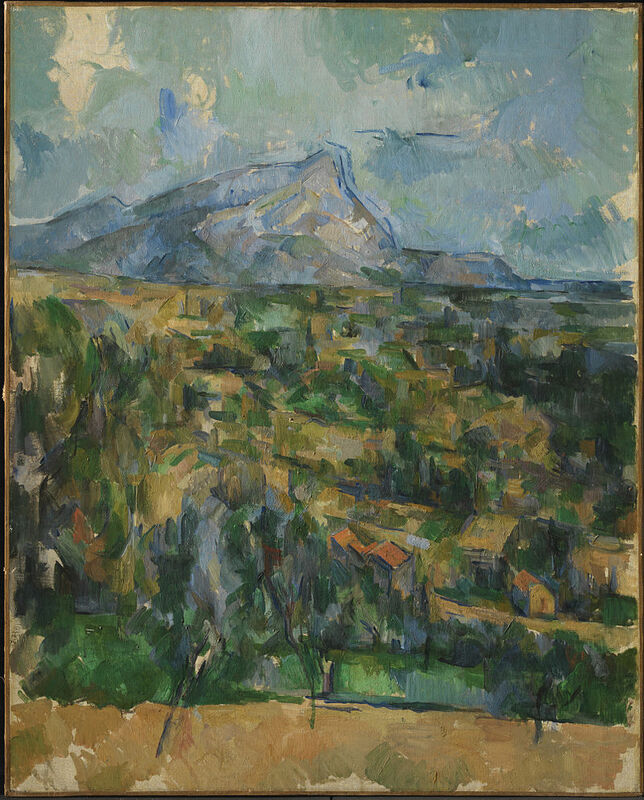 Shortly after the new Marseille-Aix line opened in late 1877, Cézanne saw the mountain from the train, and in a letter to Emile Zola a few months later, praised it for being a “beau motif” and began the series of Mont Saint-Victoires soon after. This work, in the collection at Princeton University, is slightly unusual in its vertical proportions, with the mountain cutting through the top third. The creamy band of earth at the bottom is cleverly ‘cut into’ by those thin trunks, making the space work rather than flattening the area down to a narrow ‘skirt’ of colour. I am particularly impressed by the way the colours meet the edge, pulsing in and out from surface to distance as the rhythms of each macro-passage take hold in our perception. The staccato orange roofline makes a lovely long distance call to the blue ‘thumbs-up’ towards the top left. In these paintings from the final years of his life, he was creating massive pressures, checking and adjusting the colour with every brushstroke, subtly changing direction, and giving a rich nuance to every hue with the use of the most delicate of half-tones. The works of his last couple of years sweat their colour, and each mark earns its place, feeling really bedded in to the painting, fully functional in the manner in which it describes – not depicts – the forms and interrelational spaces of the landscape. It is pointless to try to place a time, or even a season, with Cézanne, as the paintings have often been worked on over years until reaching their own timeless state. This particular one is like a thunderclap; it feels quiet, then bang, it hits you. Those areas of raw canvas superficially beg the question: finished? It looks pretty resolved to me. It’s a simple work really: a mountain, sky, some trees, and a bit of land in between with the odd building on it. In schools and colleges, Art students are quite often encouraged to “research” a subject, theme or issue that can reveal some intriguing information. The thinking goes like this: seek out something you can feel strongly about, get some facts or images together, let all this information help shape a response, the more intense or personal, the more ‘significant’ the art that can be made. Fine, admirable even, in promoting intelligence and curiosity, yet what ends up being made is highly personal in intent but invariably generic in its content as art – a sort of ‘beige carb’ art, to put it in the current parlance. Cézanne’s lesson would be the antithesis of this: look at the ordinary, at what’s around you, and how it exists, and at your materials even; take nothing for granted and discover a response that forces you to bring more to the table – to invent, to imagine, to scrutinise, to synthesise… to question how we truly perceive our world, how we see and how a human being can impose themselves purposefully within the space between sight and action. When Cézanne is painting you can see decisions constantly being made; a working-things-out as problems arise. This discovery in the moment affords us, as viewers, great freedom to enjoy the spontaneous and revel in the surprises that simple colour-upon-colour brings. Although I maintain that abstract painting offers the most uncompromised of approaches, ultimately, it doesn’t matter what art one is pursuing, what matters is how believable it ends up being. Cézanne’s greatest achievement was his complete and utter believability, achieved through humility, dedication and an ambition for a powerful specificity. Keep it simple, do it well, and give us something we can believe in.